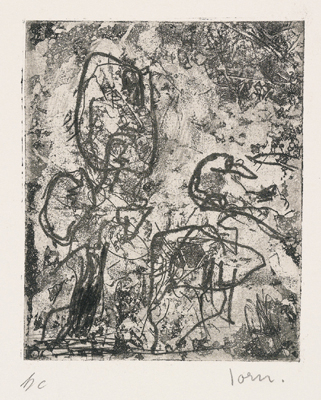 Executed in 1959, this work is one from a portfolio of eight untitled etchings. Etching printed in tones, 1959, a fine, fresh impression of the only known state, the full sheet, printed on wove, paper, with small margins, signed in pencil and inscribed "hc" in another hand, executed in an edition of 30 examples (there were also 200 unsigned examples according to Van de Loo) printed by Graf-Presse, Munich, published by Edition van de Loo, Munich, with their blindstamp, aside from a few very faint handling creases in the upper margin, in very fine condition. As there were never any "HC" proofs for this edition, the authenticity of this print has kindly been confirmed by Troels Andersen.